This view of the south side of the crescent-shaped Grand Circus Park shows two of the great hotels and towers that encompassed what was Detroit's entertainment district in the first half of the 20th Century. 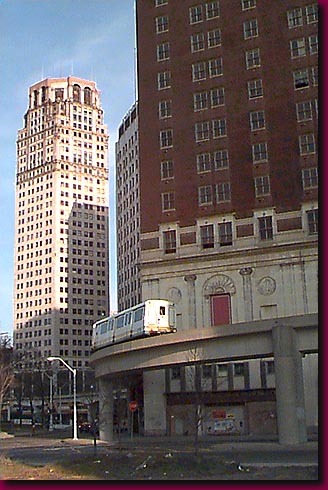 The elevated People Mover train rounds the once posh and now long abandoned Statler Hotel. To its left the empty Broderick Tower gleams in the Saturday afternoon sun on the once bustling Grand Circus Park.